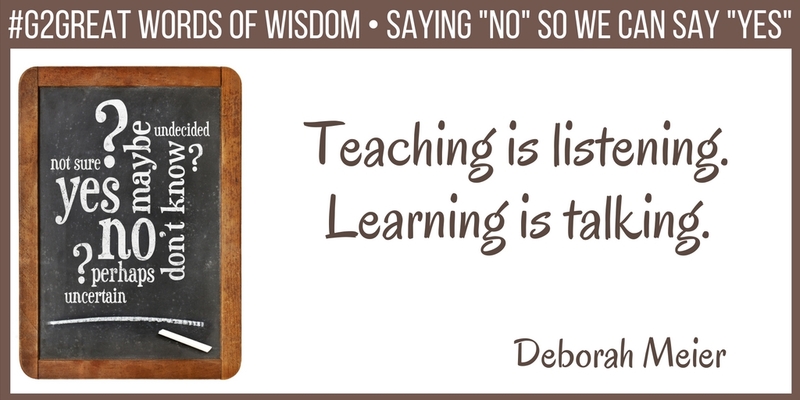 “Teaching is listening. 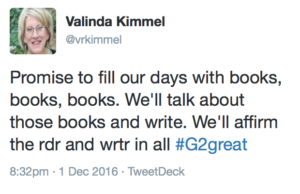 Learning is talking.” Deborah Meier’s quote was used to open the December 15, 2016 #G2Great Twitter chat. This quote speaks to the heart of this chat and places students at the center of the classroom. 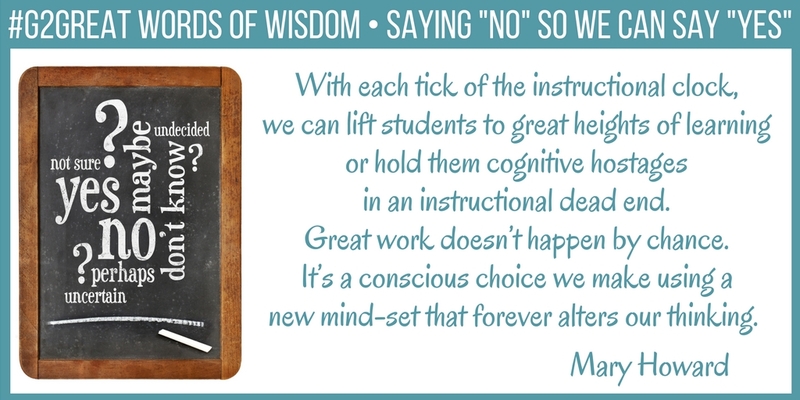 When we say “NO” to question interrogation we are able to say “YES” to engaging dialogue so we can keep our students and their learning at the center. Whenever I enter a classroom and hear that healthy buzz of a student centered classroom, it gives me a moment to pause and listen closely. Each time I am amazed at the discussions I listen to, the detailed conversations where students are growing their learning together. This happened to me just the other day in a second grade classroom. As the teacher facilitated the student to student discourse through skillful conducting, I watched in awe as I witnessed this maestro. Similar to Rodrigo from Mozart in the Jungle (an Amazon Prime Original- you must watch!) as he skillfully conducts the New York Symphony Orchestra when you watch as he leads and teaches, he is not playing the music — he is listening to the music. Of course he plays occasionally during a practice, but it is lean coaching along with very few quick demonstrations and the work or dialogue of the orchestra is done by the musicians. When the symphony practices he listens, when the symphony performs, he listens. Individual players or sections receive feedback and at times the entire orchestra will receive feedback. Always the maestro is listening. Skillful teachers are maestros and they listen to the discourse and move along as the conversations. Learning to talk, learning to question and learning to listen are all essential in a classroom that supports engaging dialogue. 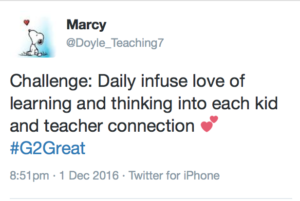 This is a practice that takes time to develop as a classroom community. Learning to engage in meaningful dialogue is not developed by questions designed to interrogate. Learning happens when the learner is “doing” the thing they are learning. Rodrigo said in episode 3 of the 1st season when he speaks about practice, “I can assure you this (practice) is the only way this music is going to get into our bones.” Students will improve in the depth of their discussions when they effectively practice. Keith Gavert shared an important point that students need to have time to think before they turn and talk. Providing time for in-the-head thinking and rehearsal allows students to practice before they say it to someone else. After individual thinking it is necessary to put our ideas out there to share and then allow them to grow in the company of others. The insight that students share helps to build on this thinking. Learning to engage in meaningful dialogue requires that students also learn to question. This is a necessary part of the process of discourse and generating questions facilitates the growth of ideas. Teachers model effective questions and teach students how to create their own questions to deepen the conversation and level of thinking. Sharing with students how to generate questions at different levels; literal, inferential and metacognitive can open so many possibilities to create engaging classroom dialogue. 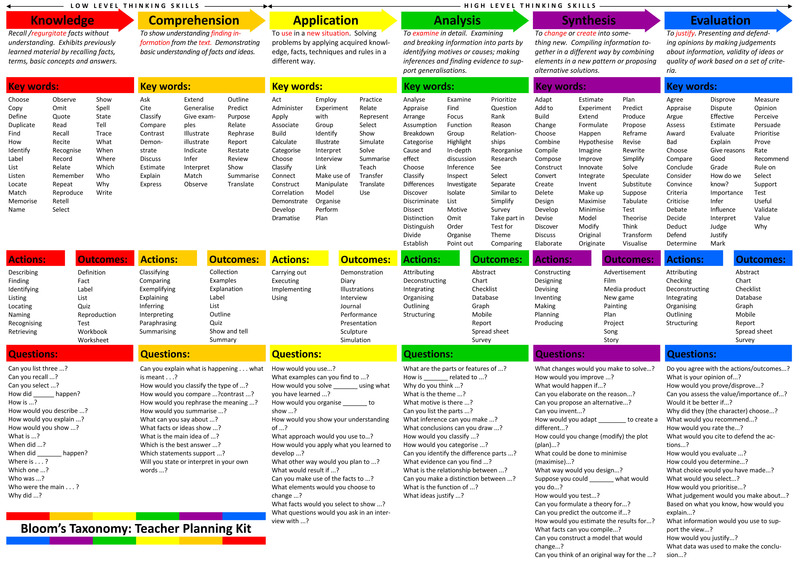 Using tools with students such as Bloom’s Taxonomy, Webb’s Depth of Knowledge or Costa’s Levels of Thinking or Questioning can provide students with the language they need to develop and understand different levels of questions. This comes full circle, just as the maestro and teacher listen to the Symphony Orchestra or the class discussion, we also have to teach students to listen, to listen closely not only to understand but to grow ideas. 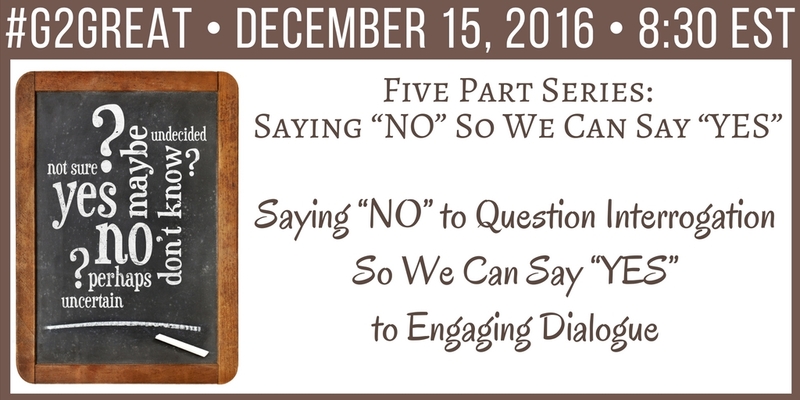 The engaging dialogue begs to be listened to, ideas cannot grow alone and without being heard. Just as Rodrigo from Mozart in the Jungle cues the orchestra to listen to certain sections of the music or orchestra, the teacher cues the class into the dialogue like what to listen for, or who said something in a partnership that needs to be shared with others. Turn and talk and share are critical elements for teachers to conduct their class discussions. 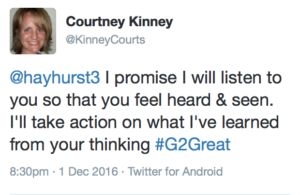 Students learn to listen closely to become stronger at discourse and to grow deeper ideas through listening, thinking and responding. If we listen closely we can be the maestro of our classroom conversations. Our students talk should be the foundation of classroom learning. If we are growing ideas together our ideas are better, it is as simple as that! The next time your class is engaging in meaningful dialogue raise your hands, hold your imaginary baton, close your eyes and listen to cue each section to grow ideas and learn. Be the maestro. On a personal note, this blog post is dedicated to the memory of Kathleen Tolan, who devoted her life to student-centered practices. 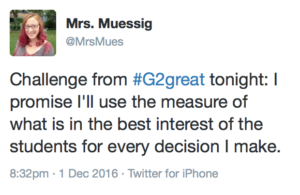 She would have been the first to, unapologetically, say “no” to whatever was not in the best interests of students. For this, and so many other reasons, she was a teacher to admire. On December 8, 2016 #G2Great continued a conversation in our Five Part Series: Saying “No” So We can Say: “Yes” as we examined the topic – Saying “No” to Teacher-Centered Instruction So We Can Say “Yes” to Student-Centered Practices. These conversations are essential to the health and well-being of our profession because as we examine our beliefs, we clarify the work the work that needs to happen in our classrooms. Our professional growth is both an individual and collective process. If we keep the conversation going, we can begin to uncover the power of our impact. Ours is a community that is devoted to discovering professional empowerment. A teacher’s life is immersed in growth We are always evolving as if we are waking up to new understandings for how students learn best. 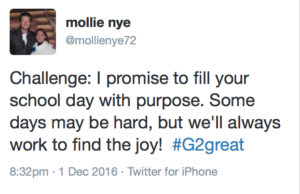 Coming together each week for #G2Great is a way to uncover these best practices and that is amazing. However, I think what I love the most about our brilliant PLN is that no matter where anyone is in the journey, we are always coming back to kids at the center and to learn with a sense of joy and wonder.